My phone doesn't have a QR code reader. How will this work? What happens if first responders don't have a QR code reader installed on their phone? What happens if I am injured where there is no internet access? Are QR codes in widespread use? Is my personal MEDWALL held securely? What about my account information? Is it secure? Can I change the information in my MEDWALL? Can my MEDWALL be accessed by someone accidentally bumping my phone? What is the difference between a tag, magnet, and a sticker? How do I add my current sticker or a second tag to my account? Can I edit my medical information? Can I add more emergency contacts or edit the existing ones? Can I put my photo on my profile? Are there other choices for Medical Tag designs? A QR Code is a type of two-dimensional barcode that consisting of an array of black and white squares, typically used for storing URLs or other information for reading by the camera on a smartphone using a QR code reader application. They look like this ..
Also, as of 2018 Apple phone cameras (with iOS 11 operating system) have a standard QR Reader built in them. When you put a QR Code in front of your phone camera it will automatically scan it. As of 2019 all phone cameras in the U.S. - Android and Apple systems - will have a standard QR reader build in them. Many smartphones have a QR reader pre-loaded and virtually all can download one. But you don't need a QR reader app to use Etagz and neither does the emergency responder. If the person who needs your Emergency Contact Information (access to your MEDWALL) doesn't have one, they can just type in OUR website URL and enter the unique code found on your tag or sticker. 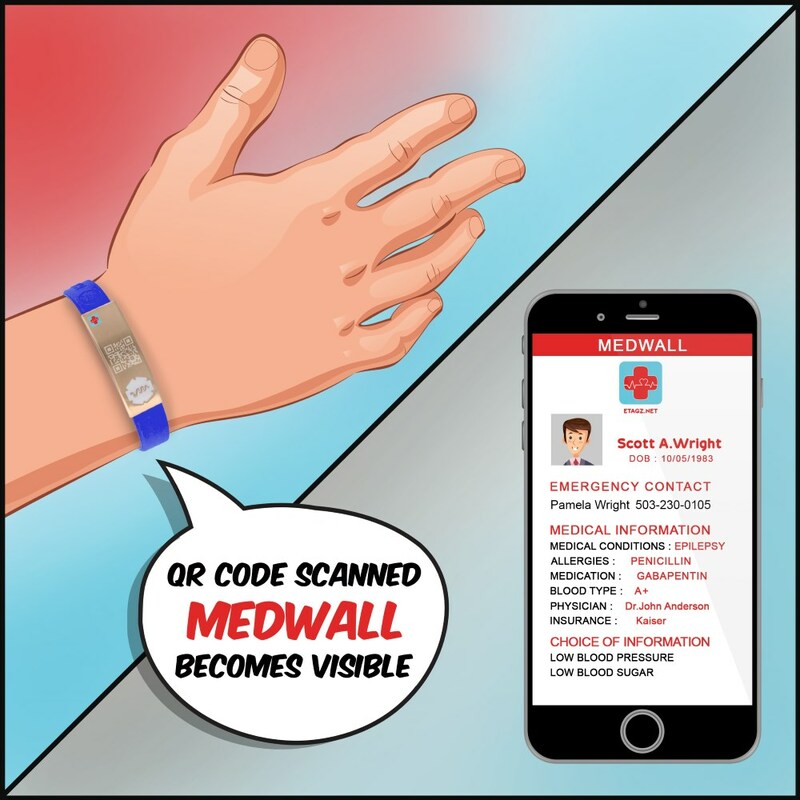 A MEDWALL is a personal web page that is linked to your Etagz QR code and immediately displays the CRITICAL medical information you choose to include when your Etag is scanned. When a EMT or First Responder or anyone Scans your Etag they immediately gain access to your CRITICAL medical information which you choose to make visible to them. They simply go to www.Etagz.net via their phone browser as they would any other website and enter the personal code printed on your tag or sticker, and your personal record details will appear to aid them. Most QR Code scanners are easy to use and very efficient and most of them are free. Choose a free version which has no restrictions or locked features. It will automatically detect and decode the QR code. The service with E-tags does require a 3G, 4G or WiFi coverage to be able to display ECI (Emergency Contact Information). Almost all First Responders and Emergency Personnel have some sort of internet access. However, we are also working on a solution for this and plan to create a Text Messaging application / tool to address this in the near future. Remember, when an ETAGZ is scanned the only information that is revealed to the scanner is what you decide to write on your MEDWALL TM, and NOTHING ELSE. Yes, it is. 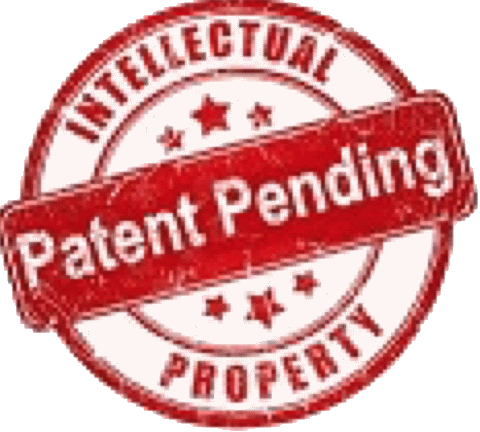 At Etagz we will NEVER provide that information to anyone except for the display of your MEDWALL to someone scanning your personal QR Code. 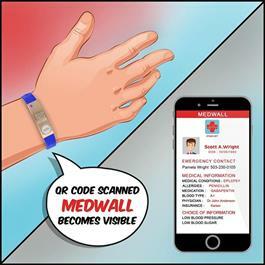 However, because the system is designed to be easily accessible by first responders the information in your MEDWALL is visible to anyone who scans your QR code or enters your tag number using the URL, so you should not put onto your MEDWALL located in your Etagz profile, any information that you DO NOT want a member of the public to see. The information displayed is totally in your control and you can change the information as often as you like. To be clear, your Etagz profile account details are kept separate from your personal MEDWALL. And your Etagz MEDWALL is never revealed to anyone other than someone accessing your personal QR Coded Medical Tag such as a First Responder. We take security serious and hold all information you provide securely. We will never sell your individual account details (name, postcode, gender, DOB and email address) to third parties. However, we may share your account details with the retailer from whom you purchased your product, and may share this data, anonymized and aggregated to provide product and industry reports. For example, the proportion of females aged 21-30 who purchase Wearable Etagz.. To be clear, your account details are kept separate from your personal MEDWALL which is never revealed to anyone other than someone accessing your personal QR Code such as a first responder. Absolutely. Anytime as many times as you would like. Simply Log In to your Etagz profile, click on the MEDWALL tab and in the box below Medical Information write the critical medical information you want to appear when your e-tag is scanned. 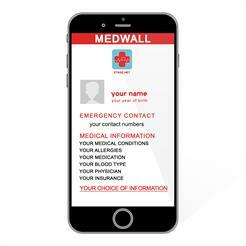 Emergency Contact Information is visible to anyone who scans your QR code or enters your tag number using the URL, so you should not put onto your MEDWALL located in your Etagz profile, any information that you DO NOT want a member of the public to see. The information displayed is totally in your control and you can change the information as often as you like. Absolutely not. Your Emergency Contact Information isn't held on your phone so there is no way to get the information from just bumping your phone. Our Etagz tags are a small plastic tag that come in many forms including with an adhesive on the back or in magnetic form or a metal ring for easily attaching to your key ring, jacket zipper, backpack, luggage, or any other place you want to attach it to. We also offer a line of wearable Etagz in various fashionable styles. You can browse our Etagz Wearables Album through the link in our website Home Page. Of course. Just email support@Etagz.net with your requirements and we'll let you know what we can do. Absolutely. Anytime as many times as you would like. Simply Log In to Etagz profile, click on the MEDWALL tab and in the box below Medical Information write the critical medical information you want to appear when your Etag is scanned. Absolutely. Anytime as many times as you would like. Simply Log In to Etagz profile, click on Emergency Contacts tab and ADD up to 3 emergency contacts. Yes there are. Besides our standard Tags you can also purchase your personal Etagz in a wearable design. There is a link to our wearables below and front page of our website. In the near future we will be offering Etagz in vinyl sticker, bike helmet sticker and fridge magnet choices. ETAGZ.NET does not store any personal medical data of its users. Medical information can only be provided through the MEDWALL tab in your user profile, which you can only choose what the contents will be. The information we suggest being put on your MEDWALL is based on standard information First Responders and MEDIC feel is critical to have when they scan your tag. 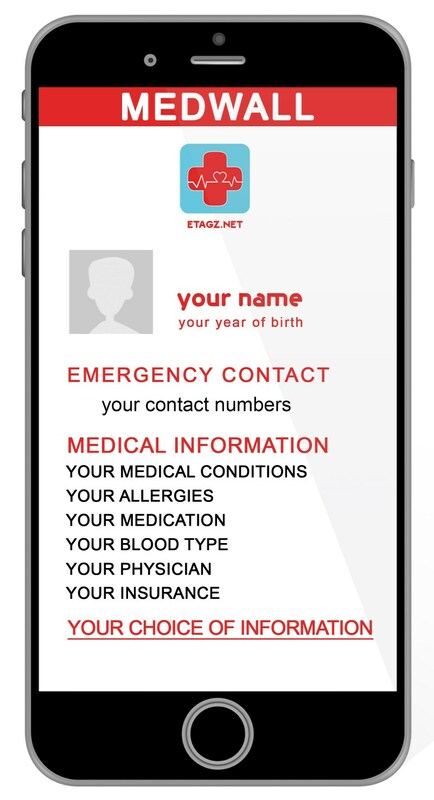 ETAGZ is designed with the intention to give individuals control and familiarity with their own medical information and how and what information they choose to provide in case of an injury or incident. Our tag speaks for you when you can not.